The 1929 half eagle issue is a curious one, struck during the year that the Great Depression began its decade-long stranglehold on the American economy, an unusual denomination to produce at a time when the theme song (written a couple of years later) was “Buddy, can you spare a dime?” Although the Mint struck 662,000 half eagles in 1929, few were ever distributed to the public. 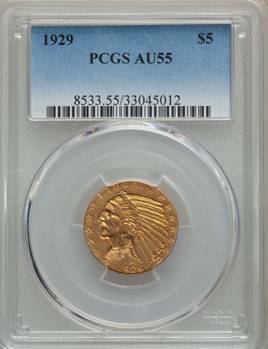 Most of the mintage was still in government vaults when the 1933 gold recall order mandated its melting. Since the issue never circulated to a meaningful extent, most pieces known today are in various Mint State grades. Examples such as this are in demand among budget-restricted collectors, and the supply is extremely limited. 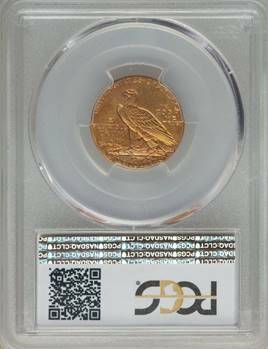 This is one of just 13 so-graded by PCGS.